Beef rendang is one of Malaysia's most recognisable and universally loved dishes, and is often served at celebrations and ceremonial occasions as well as for religious festivals like Eid. 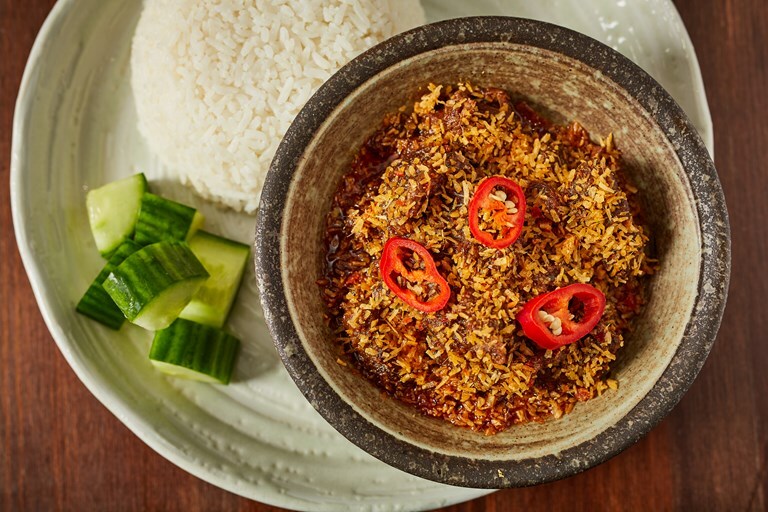 Mandy's version takes inspiration from the aromas of her mother's kitchen – toasted coconut, lemongrass, kaffir lime, cinnamon, tamarind and chilli – to create a dish that touches every corner of your palate. As Mandy says herself, rendang is labour-intensive and gets better with time, so it's always worth making in big batches! Coconut, lemongrass, kaffir lime – the smell and taste of rendang is unmistakable for all Malaysians. It is one of our national dishes. Rendang is often served at ceremonial occasions and festivals such as Eid, or to important guests due to the laborious and time-consuming cooking process. It can simply be eaten with steamed rice and sliced cucumbers. I watched my mother cook rendang often when I was growing up. There are many different recipes for rendang. Most, like my mother's, use kerisik (toasted desiccated coconut) but my recipe uses coconut cream instead to achieve more of a thick velvety sauce. This recipe is very similar to the beef rendang I serve at my restaurant. I recommend making more rendang than you need as it only gets better and better with time. Having a portion or two of rendang in the freezer is always a winner!